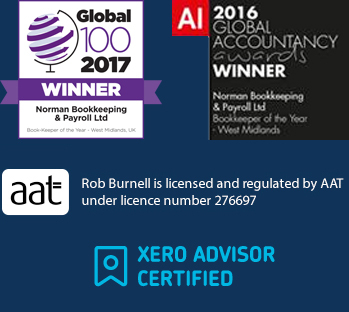 The term ‘Normans Bookkeeping & Payroll Ltd’ or ‘us’ or ‘we’ refers to the owner of the website whose registered office is 1a Birch Housem, Birch Lane Business Park, Birch Lane, Aldridge, Walsall, WS9 0NF. Company registered in England and Wales no. 09725844. The term ‘you’ refers to the user or viewer of our website. Your use of any information or materials on this website is entirely at your own risk, for which we shall not be liable. It shall be your own responsibility to ensure that any products, services or information available through this website meet your specific requirements. This website contains material which is owned by or licensed to us. This material includes, but is not limited to, the design, layout, look, appearance and graphics. Reproduction is prohibited other than in accordance with the copyright notice, which forms part of these terms and conditions. Normans Bookkeeping & Payroll Ltd.